Biking is inherently good for the environment, but killing trees is not. And yet, that is what happens when bicyclists lock their bikes to trees on the street! Sometimes this may seem like the only option if bike parking is scarce, but there are some very good reasons not to lock your bike to the trees. 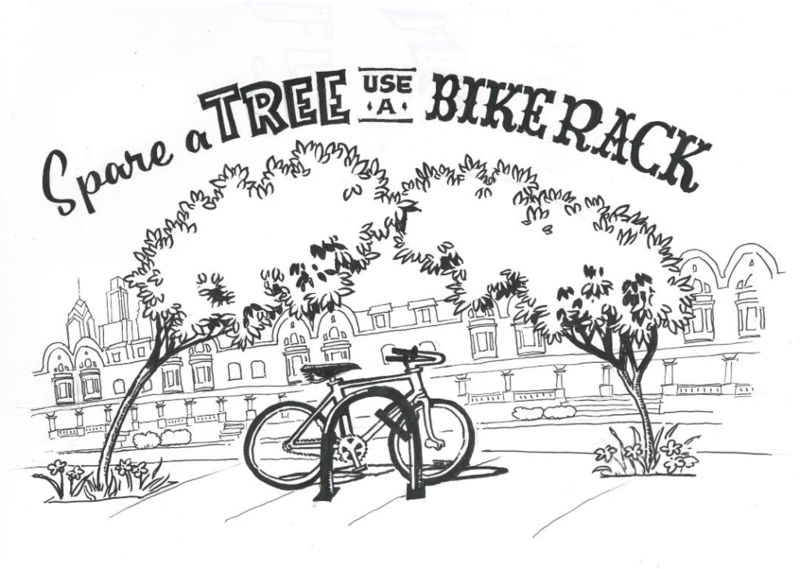 In this collaboration with Tree Philly and the Fairmount Park Conservancy, Spare a Tree, Use a Bike Rack lays out some reasons why you should save a tree, and always lock your bike to a rack. When you need to lock your bike, it seems like anything in the ground will work. However, trees are actually not secure, especially small ones that a U-lock will fit around. Thin trees can be easily cut down by bike thieves, which results in the loss of the bike and one less tree in the city. Just a few years ago bike thieves were filmed chopping down a ginkgo tree in Brooklyn to steal a bike. Here is a video. 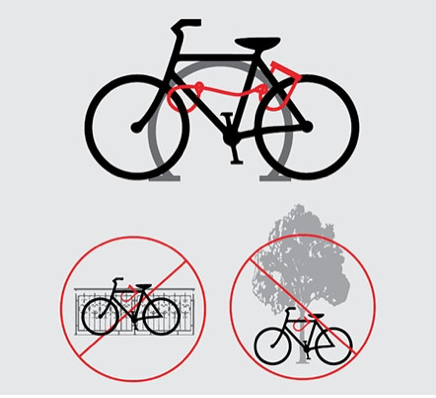 Aside from the danger trees are being put in from potential bike thieves, trees can also be damaged or killed just from fitting a lock around it. There is a layer of living tissue underneath the bark of the tree and it can be gashed or cut easily by locks or chains. If this happens, diseases that affect trees can invade more easily, or the cut can sever the nutrient system of the tree. The tree will die either way. This is explained very well in a post on the Montague Bikes’ blog. Additionally, trees will grow around abandoned locks, which can damage and kill the tree as well. This could also be potentially dangerous for houses and cars around the tree if it dies and falls over. Locking bikes to trees can damage, kill, or put the tree in danger of being cut down. 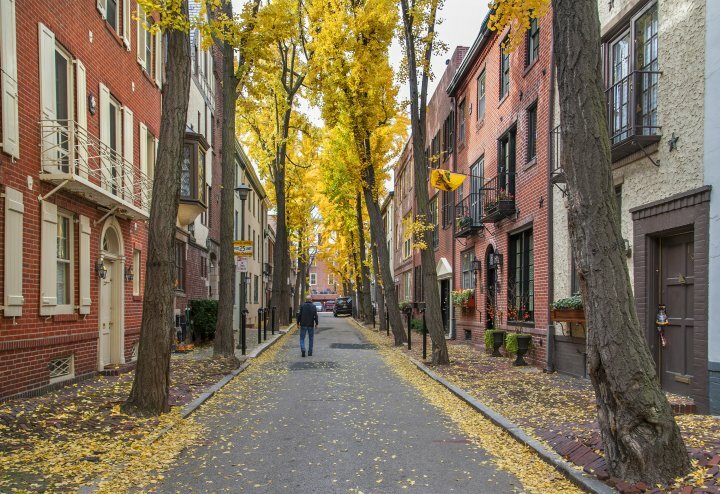 All of this can result in the loss of a tree, which reduces the tree cover in Philadelphia. Tree cover helps combat climate change by absorbing carbon dioxide, as well as reduces storm water runoff, enhances quality of life, contributes to savings on energy bills, and serves as habitat for wildlife. This is a problem in many cities as more and more citizens turn to bikes instead of cars. Many cities are now having to remind their bicyclists that trees are not bike racks and are not safe places to lock your bike. Available bicycle parking is a problem in Philadelphia but here is a set of useful information about installing city bike parking.